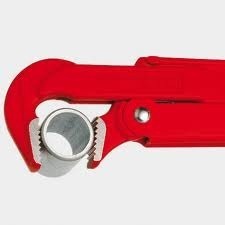 We have with us extensive experience in successfully meeting the demands of Pipe wrenches 90° that are made available in 90" angled jaws. These jaws are made available with offset teeth in opposite directions and come additionally induction hardened so as to provide durable performance. Other than this, these also feature captive adjusting nut. The models these are made available in include PW-9010 in lengths of 1"	(310mm), PW-9015 in lengths of 1-1/2" (420mm), PW-9020 in lengths of 2" (560 mm), PW-9030 in lengths of 3" (625mm) and PW-9040 in lengths of 4" (750mm).